Christ Fellowship is located in one of the most unchurched regions of the United States. As one of the largest and fastest growing churches in the country, they were looking for a ministry partner who would help push them the direction they were wanting to go and not just a contractor who would do what they were told. After identifying mutual core values between our organizations, the new construction of their Port St. Lucie location proved to be a great fit. Mankin was brought to the table when Christ Fellowship's leadership was not satisfied with the current stage shape, the feel at the front of the room, and wished they could gain more seats. Many late night conversations occurred around what constitutes an immersive space, what was already working for the church, the most prioritized needs, and so on. Through active collaboration, we reimagined the entire infrastructure to meet their needs. 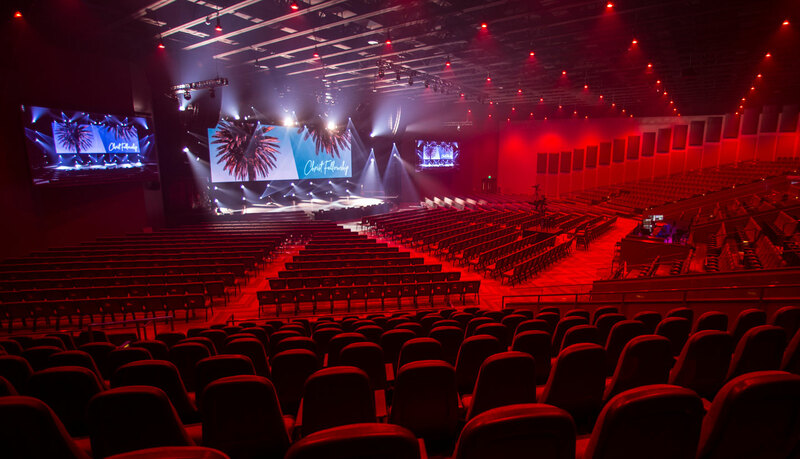 After working through multiple factors with both the church and their building engineers, we successfully reworked the stage, added 138 additional seats, reconfigured the control room, introduced a touring hybrid approach, and much, much more. Additionally, because this is a video teaching venue and the first room for the church that would have LED walls - the size, placement, and viewer experience related to these displays were critical to get right. Meticulously managed procurement and pre-build phases ensured the entire system was made to function in our Franklin, TN headquarters prior to shipping to site. Our team then spent 5 weeks in South Florida deploying the system into the space and another week commissioning the systems, training the church’s production staff, and assisting with first service support. Careful planning and ongoing collaboration delivered this project on time and on budget. Because Port St. Lucie is a satellite campus rather than the main broadcast campus, it was important for contingencies and redundancy to be built into this system wherever possible. Not only would this proactively minimize the risk of catastrophic failures that could take down any portion of the system during standard operation, but it also helps ensure that a minor issue never turns into a major one when staff members may or may not be present. The loudspeaker system features the L-Acoustics K2 system. Mankin collaborated closely with L-Acoustics and the church to marry the loudspeaker design to both the acoustic performance signature and treatment design, as well as addressing pre-existing challenges in other spaces specifically related to how it sounds in the first few rows where the pastors sit every week. Due to the stage shaping that was required to address leadership’s goals in this area, there was less available space under the stage for subwoofers. Thanks to L-Acoustics, this was not a problem – the majority of LF in the system originates from the air between the K2 and K1SB loudspeakers flown over the stage, with supplemental infra LF produced by a smaller number of KS28 subwoofers located under the stage. The result is a tremendously even and consistent audio experience throughout both floor and stadium seating. All of the LED video panels in the system are CreateLED AirMAG-S 2.9mm panels. Such large surfaces at such high resolution (the center screen pixel space is 4928 pixels wide) made canvas management and scaling extremely important. We implemented a Barco E2 system to accomplish this purpose. Latency throughout the broadcast video and LED canvas systems is extremely low and the result is stunning. The theatrical lighting plot for this room represents a new philosophy compared to every other Christ Fellowship venue. With an increased value on lighting and the intentional introduction of visual layers, there are exponentially more fixtures than in their other spaces. This increase in quantity would allow one rig to deliver a variety of different looks and feels from a common toolset, and rarely, if ever, would all fixtures be on at the same time. Every fixture in the system is moving head LED – a mixture of Chauvet and Martin instruments – further increasing flexibility and creative options. This room represents the highest level of production systems, forward thinking design, and immersive environment in the house of worship market today in the United States. Class leading technology implemented with intentionality provides a cohesive worship space that truly sets the bar for others. We are at our best when we are trusted to challenge the status quo and partner with a high impact client to create an enveloping, immersive space. This project’s success was founded upon a highly collaborative design/build process, and has established a new bar for Christ Fellowship going forward.